New analytical methods show for the first time, how the permeable, sandy sediment at the bottom of the North Sea is supplied with oxygen and which factors determine the exchange. Based on the detailed investigation and new measurement technology described by a research team led by GEOMAR Helmholtz Centre for Ocean Research Kiel, the turnover of organic matter and nutrients at the sea floor as well as future changes within the dynamic ecosystem can be better assessed. A desert at the bottom of the sea? Although the waters of the North Sea exchange about every two to three years, there is evidence of decreasing oxygen content. If lower amounts of this gas are dissolved in seawater, organisms on and in the seabed produce less energy – with implications for larger creatures and the biogeochemical cycling in the marine ecosystem. Since nutrients, carbon and oxygen circulate very well and are processed quickly in the permeable, sandy sediments that make up two-thirds of the North Sea, measurements of metabolic rates are especially difficult here. Using the new Aquatic Eddy Correlation technique, scientists from GEOMAR Helmholtz Centre for Ocean Research Kiel, Leibniz Institute of Freshwater Ecology and Inland Fisheries, the University of Southern Denmark, the University of Koblenz-Landau, the Scottish Marine Institute and Aarhus University were able to demonstrate how oxygen flows at the ground of the North Sea. Their methods and results are presented in the Journal of Geophysical Research: Oceans. "The so-called 'Eddy Correlation' technique detects the flow of oxygen through these small turbulences over an area of several square meters. It considers both the mixing of sediments by organisms living in it and the hydrodynamics of the water above the rough sea floor", Dr. Peter Linke, a marine biologist at GEOMAR, explains. "Previous methods overlooked only short periods or disregarded important parameters. Now we can create a more realistic picture." The new method also takes into account the fact that even small objects such as shells or ripples shaped by wave action or currents are able to impact the oxygen exchange in permeable sediments. On the expedition CE0913 with the Irish research vessel CELTIC EXPLORER, scientists used the underwater robot ROV KIEL 6000 to place three different instruments within the "Tommeliten" area belonging to Norway: Two "Eddy Correlation Landers" recorded the strength of oxygen fluxes over three tidal cycles. 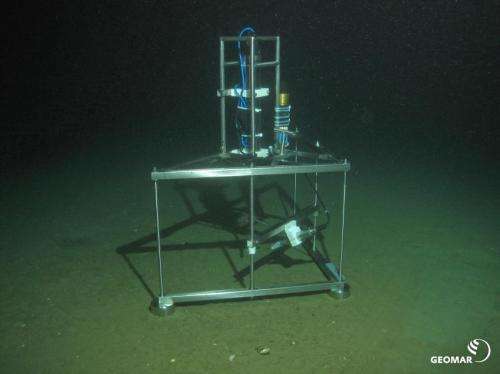 Information about the distribution of oxygen in the sediment was collected with a "Profiler Lander", a seafloor observatory with oxygen sensors and flow meters. A "Benthic chamber" isolated 314 square centimetres of sediment and took samples from the overlying water over a period of 24 hours to determine the oxygen consumption of the sediment. "The combination of traditional tools with the 'Eddy Correlation' technique has given us new insights into the dynamics of the exchange of substances between the sea water and the underlying sediment. A variety of factors determine the timing and amount of oxygen available. Currents that provide the sandy sediment with oxygen, but also the small-scale morphology of the seafloor, ensure that small benthic organisms are able to process carbon or other nutrients. The dependencies are so complex that they can be decrypted only by using special methods", Dr. Linke summarizes. Therefore, detailed measurements in the water column and at the boundary to the seafloor as well as model calculations are absolutely necessary to understand basic functions and better estimate future changes in the cycle of materials. "With conventional methods, for example, we would never have been able to find that the loose sandy sediment stores oxygen brought in by the currents for periods of less water movement and less oxygen introduction."